Last summer I decided to quit People magazine. 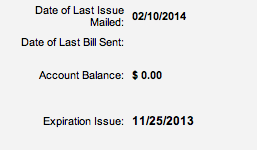 As in, come November 2013, I would not renew my subscription. The notices came and went and I didn't reply. But the magazines keep coming. I've logged on to my account to make sure it wasn't an automatic renewal (and open all letters I get from them to make sure I am not renewed -- they just say they want me back...). But, again, the magazines keep coming. So I'm putting it out there (but not calling customer service, because that would be too honest) that two and a half months later I'm still receiving People without interruption or payment.